The Knights conducted the December 8 Bingo at the DuPage Convalescent Center (DCC) in Wheaton. The Knights donated $200 to the winners and made Christmas special for more than 50 residents. Pictured on the right is Julian Pineda with Tony Reyes. 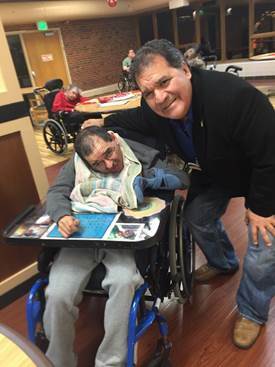 Julian (brother of Mayor Ruben Pineda, West Chicago) was struck by a hit and run driver in 1975 and has been a grateful resident at the DCC for 40 years. He is a living miracle. God Bless the DCC and the Knights for hosting a bingo several times per year. Fellow Knight Skip Meyer also a resident at the DCC and coordinated all the Bingo nights. Hope to see the knights at the next DCC bingo. Good time had by all! Looking for the perfect packaging for your company?